This perfectly roasted chicken with stuffing will be a star at any buffet line. Dilute Knorr Lime Powder in Filtered Water. Marinate whole chicken with salt and Lime Juice. Blend Shallot, Garlic, Red Chili, Red Bird Eye Chili, Dry Shrimp Paste, Turmeric Powder, Coriander Powder, Ginger, Galangal, Lemongrass, Filtered Water, Corn Oil and Knorr Tom Yam Paste. Apply a portion of Blended Paste onto chicken. Add the remaining Blended Paste to Tapioca Leaves and Lime Leaves to create stuffing. Stuff the chicken with the stuffing. 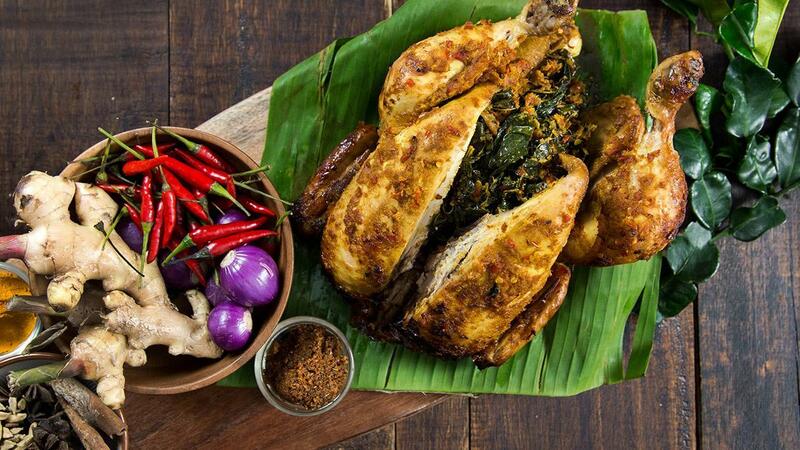 Wrap Chicken with Banana Leaves and Steam for 5 minutes. After that bake in oven at 175 Degree Celsius, for 25 minutes.